Super high performance low-voltage weather-resistant (IP67 rated)ultrasonic range finder with high power output, advanced noise rejection, 1 hour fail-safe, auto calibration and long-range narrow detection zone. This sensor has advanced filtering to ensure reported ranges are valid. The sensor also features a fail-safe which will report 0-cm when no valid target is detected for 1 hour. 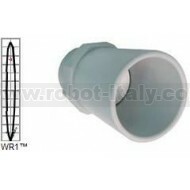 The XL-MaxSonar®-WRA sensor provides very short to long-range detection and ranging, in a compact, robust PVC housing, designed to meet IP67 water intrusion, and matches standard electrical ¾” PCV pipe fittings. The sensor puts 1/2 watt of peak power into the efficient transformer driving the transducer, yielding high output acoustic power. This acoustic power combined with continuously variable gain, real-time waveform signature analysis, and real-time noise rejection algorithms result in virtually noise free distance readings for most users. This holds true even in the presence of many of the various acoustic or electrical noise sources. The XL-MaxSonar®-WRA-MB7072 detects objects from 0-cm to 765-cm (25.1-feet) and provides sonar range information from 20-cm out to 765-cm with 1-cm resolution. Objects from 0-cm to 20-cm range as 20-cm. The interface output formats included are pulse width output, analog voltage output, and serial digital output. Click here for more details on the new product features.